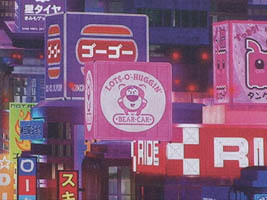 Lotso Huggin’ Bear (meet & greet photos/video HERE) appears in the artwork on the wall (below, left). 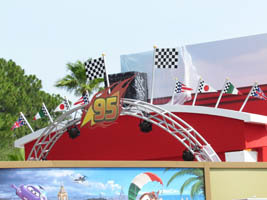 A closer look shows the various country flags (below, right). 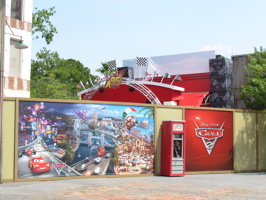 Video #1 – Disney Pixar Cars 2 Meet & Greet Construction Update Disney’s Hollywood Studios – The Cars 2 Meet & Greet at Disney’s Hollywood Studios is getting close to ready for guests! 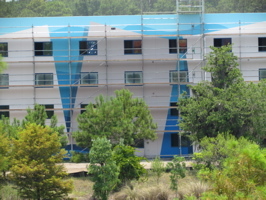 Disney’s Art of Animation Resort has changed quite a bit in the two weeks since we’ve visited! 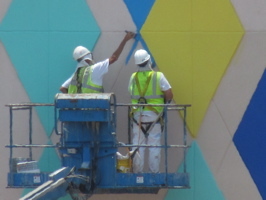 The main hall is now being painted on the Pop Century side (below left and right). 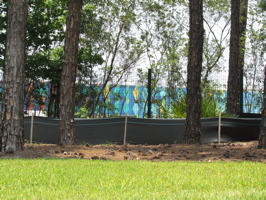 The Finding Nemo pool area was being worked on (below, left), and the ground was being prepped in the Cars section of the resort (below, right). 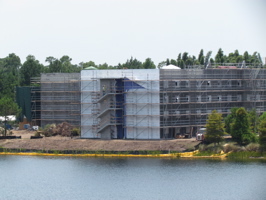 It’s about a year until the resort opens to guests, Disney is now taking reservations! 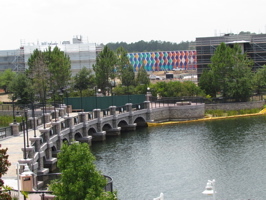 More color has been added to the Finding Nemo wings (below, left), and there is some work starting on the Little Mermaid buildings (below, right). 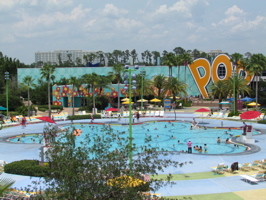 For full details including concept art from the Destination D presentation last month, please click HERE. 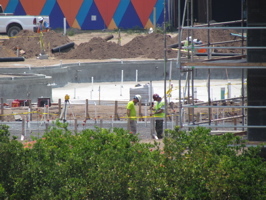 Video #2 – Art of Animation Resort Construction 6/21/11 Walt Disney World – Disney’s Art of Animation Resort is due to open next year, this is what it looked like yesterday! 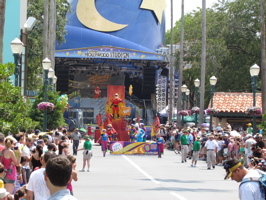 Disney has just started taking reservations this past week. 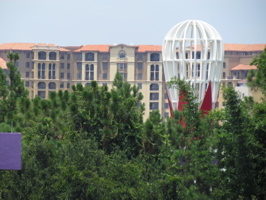 Behind Disney’s Pop Century Resort, we’ve occasionally noticed these tall buildings but never really thought about where they were from until after we drove into the Bonnet Creek Resort area (below left and right). 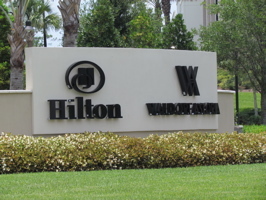 Some of the best-reviewed hotels on Trip Advisor actually are in Bonnet Creek, though I’ve only been there once – the hotels include this Hilton (below left and right) and a Waldorf Astoria Hotel. 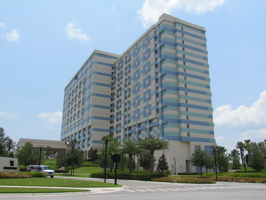 We were surprised at how reasonable the pricing is, considering the location and high marks all of these hotels receive. 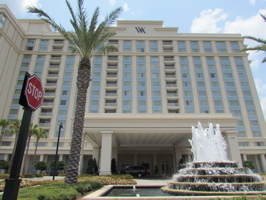 The Waldorf Astoria (below, left) looks stately with a pretty fountain out front. 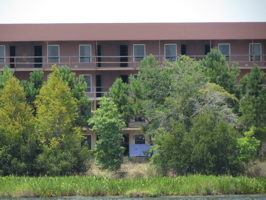 We checked a random date in early July, the the price was under $200 per night. That can be higher or lower depending on season and other factors, but it was much less than we expected to find! 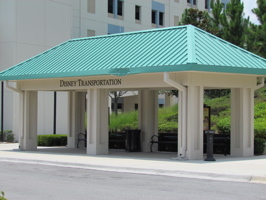 This area is not Disney-owned, but the hotels do provide transportation for guests to the Disney parks (below, right). 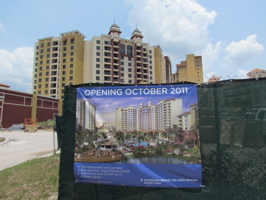 A new resort is being built (below, left and right) – the Wyndham Grand Orlando Resort, set to open in October, 2011 with 400 rooms and a zero-depth lagoon style pool. 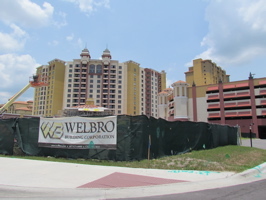 Reservations are being taken for October 15th and beyond!